How to Insert Comments in PowerPoint 2013 Slide? 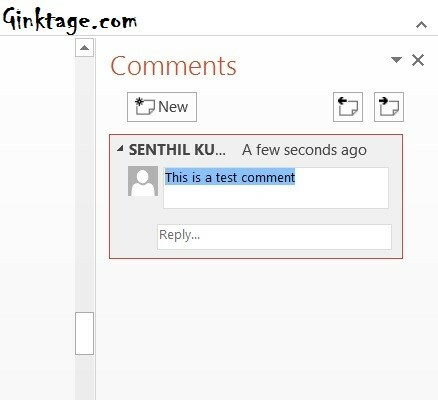 There are times when you want to add a small note in the slide as comments in PowerPoint slide in Microsoft PowerPoint 2013. You can quickly add the comments by following the below steps. 2. Select the slide where you want to insert the comment and navigate to “INSERT” tab and click “Comment” button in the comments group. 3. This will display the Comments Dialog for the slide. Click “New” button to add new comment to the slide and then enter the comment in the comment text box and press enter key. 4. You are done. The comments for the current slide can be viewed in the same dialog.